Ensuring integrity within the supply chain is paramount to the successful distribution of pharmaceutical products. With increasing concern of an influenza pandemic, the operation of pharmaceutical and medical logistics has been brought into the limelight and issues regarding integrity, traceability and material pedigree have emerged as key issues that must be addressed. 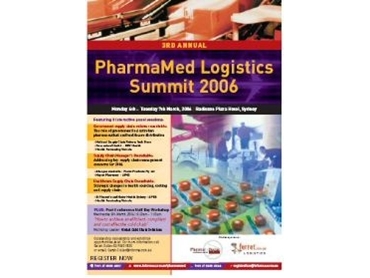 The 3rd Annual PharmaMed Logistics Summit in Sydney 2006, organised by Informa , will feature detailed presentations and case studies on how to ensure that the right health care product is available at the right place and time, efficiently supporting health care services and the clinical needs of the end-consumer, this summit will attract a strong delegate profile from along the pharmaceutical and medical supply chain. The summit also includes a half day workshop on "How to achieve an efficient, compliant and cost effective cold chain". Relevant not only to the pharmaceutical supply chain industry, this highly interactive tutorial will enable you to facilitate your own 'virtual' real-time distribution scenario, via new internet measures. It also carries important information for food manufacturers who need to ensure that they are meeting their temperature controlling responsibilities in the transportation of foodstuffs. With perspectives from State health procurement authorities, hospitals, pharmacy services, and also leading pharmaceutical manufacturers including Mayne Pharmacy, Allergan, and Roche Products, can anyone in the pharmaceutical or medical supply chain industry, afford to miss out on the knowledge-sharing opportunity at this event?